. . . you will spend quite a bit of time on salt water. There is a slowing down of the experience of art due to the travel between venues, especially on ferries. This is very healthy: salt water helps to heal respiratory problems . . . as well as calming the nerves. I can endorse the first two points and to some degree the latter, although there was a certain anxiousness involved in attempting to get to all the venues, especially those on semi-distant shores. Interestingly it was Christov-Bakargiev’s 16th Biennale of Sydney in 2008 that first incorporated Cockatoo Island, a former prison and shipyard, as a major multi-site location — ‘The magnificent sites of industrial archaeology’, as she put it at the time — together with the usual gallery and Walsh Bay pier venues. With the Istanbul Biennial’s 36 widespread venues showing over 200 participants, clearly it was not possible to see everything in the time that most opening-week visitors had and, indeed, at the media launch, Christov-Bakargiev confirmed this adding (to paraphrase her): ‘This Biennial is not solely for us who may be here for a limited amount of time, but for locals, and locals who have plenty of time.’ There were also around 60 additional parallel shows in over 40 other venues and many presentations — including programs of films and events for youth — staged over the two-month period of the Biennial. Key to the success of viewing and understanding a biennial like this one was the compact guide book of around 200 pages, echoing in style the exhibition catalogue (except in size and volume of text). Unfortunately the guide book’s many satellite images were virtually useless as maps to locate venues, but, in fairness, you could use the biennial’s smart phone app which some said was functional. At any rate, the frustrations of many visitors struggling to pin-point venues were eased over the first few days of the vernissage as there were helpful young people with Biennial signs at almost every location. The biennial took place in four main venues: Istanbul Modern, ARTER, the Italian High School, and the Galata Greek Primary School. At these, all in the old European quarter of Beyoğlu, visitors encountered the key group exhibitions, whereas most other locations — storefronts, gardens, garages, hotel foyers, underground cisterns, a boat, ruined houses and crumbling palaces — hosted the work of a single artist or collective. The latter were found from the Black Sea coast, south across Istanbul and on to the Princes’ Islands in the Sea of Marmara. What a trek it was that led to historic buildings and fascinating places that, as a normal visitor to Istanbul, you may not have encountered. This was nowhere better experienced than on Büyükada (Big Island), one of nine of the Princes’ Islands group — a 45 minute ride on the fast ferry from the busy port district of Kabataş on the Bosphorus. Some of the most intriguing venues and inspiring art works were to be seen on this seductive island with its natural settings, historic wooden houses and mansions, phaetons — horse-drawn buggies with fringes (this holiday island is car-less) — and bicycles everywhere. As the brochures point out, Leon Trotsky lived here from 1929 to 1933, in exile and in fear of assassination. William Kentridge, ‘O Sentimental Machine’ 2015. 5-channel video projections. Installation view, Hotel Splendid Palace, Büyükada. Photo: Sahir Ugur Eren, IKSV Media. Three-quarters of the way up a set of stairs from the boat quay, on a first floor foyer of the art nouveau inspired Hotel Splendid Palace, was William Kentridge’s multi-channel video installation, O Sentimental Machine (2015). Kentridge’s not so remarkable work used edited black and white historical footage including excerpts of Trotsky’s speeches to comrades. ‘He sends and receives letters, dictates messages, participates in historical events . . . Utopian thinking is both impossible and necessary’, the guidebook tells us by way of explanation. Ed Atkins, ‘Hisser’ 2015. Two-channel video, multiple audio channels. Installation detail, Rizzo Palace. Photo: Ian Were. From here, about a half-kilometre uphill walk along tree lined streets, is Rizzo Palace, built in the nineteenth century for its first owner Stefan Rizzo. This now dilapidated three story wooden house was the perfect venue for a memorable Ed Atkins two-channel video, Hisser (2015). It tells the story of the last half hour in the life of a man (Atkin’s avatar) who disappears down a sinkhole. As the music and sound gradually and dramatically increased, the images revealed a controlled chaos where everything surrounding the man moved, morphed and shaked, including, it seemed, the old palace we were standing in. Not far away on the ground floor of the imposing Mizzi Mansion was Susan Philipsz’s sea-theme installation of large-scale photographic prints with sound, Elettra (2015). Nearby at the white twin house at number 57 Çankaya Caddesi — built in 1908 by an Armenian tradesman for his two daughters — was Daria Martin’s poetic 16mm film, At the Threshold (2014-15). Adrian Villar Rojas, ‘The Most Beautiful of All Mothers’, 2015. Organic and inorganic materials. Site specific installation, Yanaros Mansion/Trotsky House. Photo: Ian Were. Back in Istanbul, two of this year’s biennial venues were closely connected to Turkish-Armenian journalist and activist Hrant Dink who was gunned down in Istanbul in January 2007 by a 17 year old Turkish nationalist. As editor of the bilingual Turkish-Armenian newspaper Agos, Dink was best known for advocating Turkish-Armenian reconciliation and human rights. He was critical of both Turkey’s denial of the Armenian genocide and of the Armenian diaspora’s campaign for its international recognition. Dink was prosecuted three times for ‘denigrating Turkishness’ and received numerous death threats from nationalists. At his funeral, over one hundred thousand Turkish citizens marched in protest of the assassination, carrying placards and chanting, ‘We are all Armenians’; ‘We are all Hrant Dink’. Ayreen Anastas and Rene Gabri, ‘Multi-storied house; Stables, Folds and Barns; Farms and Summer Houses; Destroyed Vineyards, Orchards and Vegetable Gardens, etc …’ 2015. Mixed media. Installation, Hrant Dink Foundation and Agos. Photo: Ilgin Erarsian Yanmas, IKSV Media. On a main street in the bustling district of Şişli (which by the way boasts Europe’s largest shopping mall) is the apartment building housing the old offices of the Hrant Dink Foundation and Agos. Two collaborative artist-activists Ayreen Anastas (born in Bethlehem, living in New York) and Rene Gabri (born Tehran, now in New York) had taken up a two-month residency in these offices. As both artists stated that they ‘dislike biographies’ it was fortuitous that Gabri was there when I visited to explain the work. He began by talking about his Armenian heritage, referring to what many descendants say: stories of families escaping the troubles in Anatolia within the Ottoman Empire around the time of the First Would War. 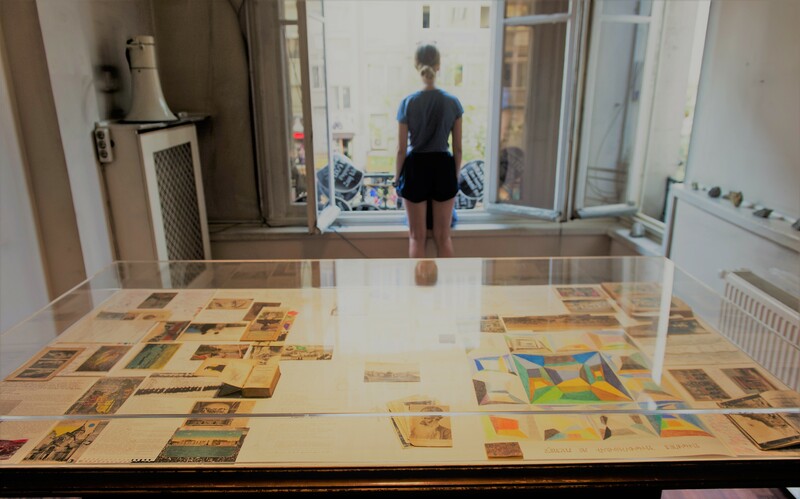 Gabri said that what we were looking at within the table-sized vitrine — a collection of old postcards, drawings, watercolours, notes and altered books — referenced the everyday lives of Armenians at this time in history. He went on: A number of Armenians were photographers, hence the postcards; found books were from family libraries including an Armenian bible at some stage in its long life innocently scribbled on by a young child. He noted that this art work was not intended as a history lesson or a didactic rant; nor did it appear that way. While the ephemera did not directly reference the Armenian genocide, its shadows were there. A few blocks from this building along busy Halâskârgazi Caddesi and you were at the second Dink venue, the newly opened Hrant Dink Foundation where young Vietnamese artist Nguyen Huy An presented ideas about memory and the streets of Hanoi. Anna Boghiguian, ‘The Salt Traders’ 2015. Mixed media, sound. Installation view, Galata Greek Primary School. Photo: Sahir Ugur Eren, IKSV Media. At other venues around Istanbul several artists, either of Armenian heritage, or exploring ideas about Armenian issues, were easy to find. 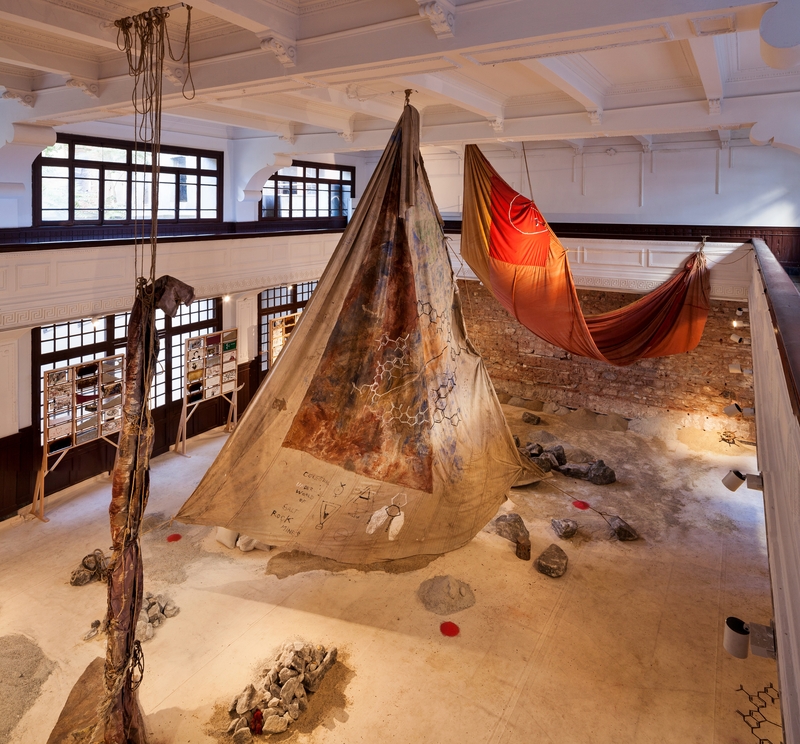 On the ground floor of the neoclassical Galata Greek Primary School in Beyoğlu, was Anna Boghiguian’s (born Cairo, lives in various countries) large-scale installation The Salt Traders (2015), made of disparate materials including textiles, wax, gouache, salts and sea sounds. On the top floor Michael Rakowitz (lives and works in Chicago) brought together several Armenian ghosts in The Flesh is Yours, The Bones Are Ours (2015), a moving installation combining plaster moulds, casts and bones of livestock from dispossessed Armenian farms in Anatolia. Also at the Greek school were two 30-minute performances by the Beyoğlu Holy Trinity Armenian Church Choir; at the end of each refrain, marked by a staccato clash of cymbals, they moved up the staircases from one floor to the next. The folkloric song, Wavy Is the Sea of Bolis, O Mother, by Armenian-Turkish oud master Udi Hrant Kenkulian (whose family survived the genocide and lived in Istanbul from 1918 onwards), was presented by Lebanese-born artist Haig Aivazian. The work combined ‘two complex sets of melodic, cultural and linguistic creolisations’, said Aivazian. This was an inspired inclusion. A short walk away at DEPO was Francis Alÿs’s compelling video The Silence of Ani (2015), dramatically shot in black and white. Alÿs used the ruined medieval city of Ani situated on the far eastern border of Turkey and Armenia, a civilisation that collapsed around 700 years ago, to show the fragility of man-made borders and the possibilities of regeneration. He has armed children with whistles that replicate birdcalls, just visible as they dash through the ruins calling to each other. Aslı Çavuşoğlu, ‘Red/Red’ 2015. Carmine-red from Armenian cochineal. Installation detail, Istanbul Modern. Photo: Sahir Ugur Eren, IKSV Media. 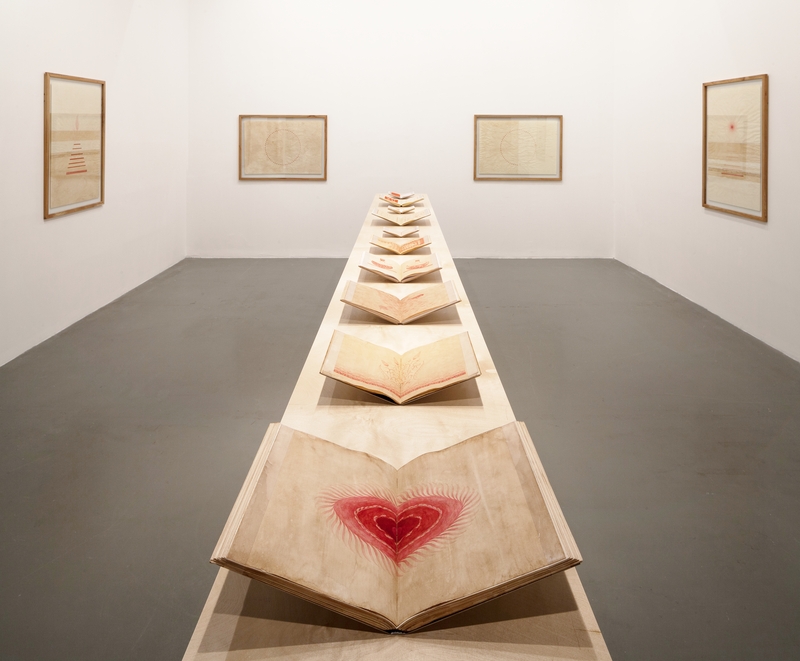 Down by the Bosphorus at Istanbul Modern — the main venue and where you could view the largest segment and heart of this complex exhibition — was Aslı Çavuşoğlu’s delicate drawings, Red/Red (2015), which used carmine-red ink made from Armenian cochineal (a scale insect indigenous to the Ararat plain) applied to worn-out papers and notebooks. Nearby Turkish author Orhan Pamuk’s Eight Notebooks (2008­–13) were full of gentle hatched marks and brush strokes — of wavy seas, boats and birds, together with fragments of automatic writing. 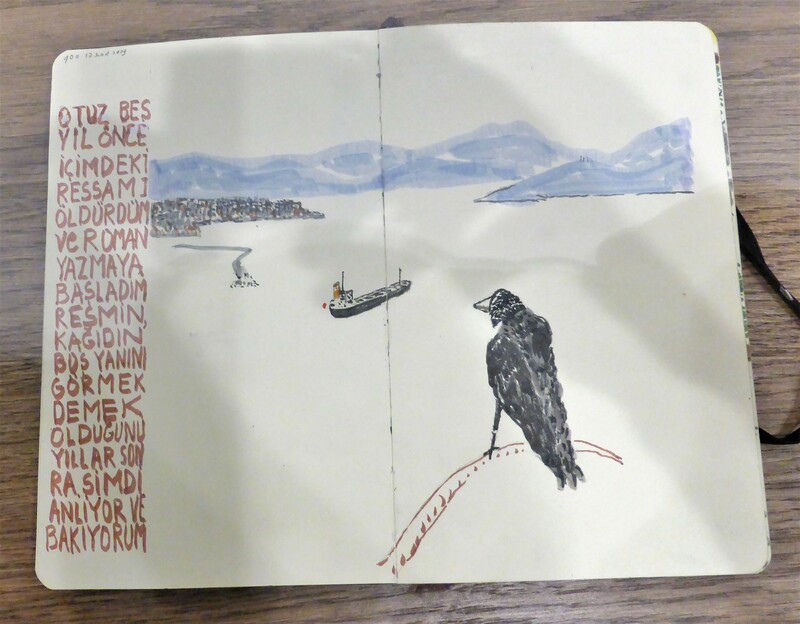 Orhan Pamuk, ‘Eight Notebooks’ 2008-13. Detail. Watercolour, pencil, acrylic and pastel on paper. Istanbul Modern. Photo: Ian Were. Elsewhere, on the top floor of Pamuk’s poignant creation, the Museum of Innocence, you could seek out two Arshile Gorky (1904-1948) drawings: Act of Creation (1947) and Vale of the Armenians (1944). These additions from Armenian-born Gorky were both a joy and a little discordant — particularly given this was the only venue asking an entrance fee. Like Hrant Dink, Pamuk, who has made statements about Armenian issues, was charged with ‘insulting Turkishness’ in early 2006 but this was subsequently dropped; later that year he won the Nobel Prize in Literature. On the centenary of the genocide Christov-Bakargiev did a remarkable job of subtly integrating artwork from artists with Armenian backgrounds and ideas. At the press opening she said it was ‘very timely’ to speak about what happened 100 years ago, as well as the ‘traumas and ethnic cleansing’ that has occurred in other parts of the world throughout history, including Australia, Poland, Germany and Syria.
. . . one must strive to become, tough and philosophical concerning destruction and death, for this is what most of mankind has been best at since we have heard of man . . . But it is not permissible that the authors of devastation should also be innocent. It is the innocence which constitutes the crime. Vernon Ah Kee, ‘Tall Man’. 4-channel video installation based on the 2004 Palm Island riots. Installation view, Istanbul Modern. Photo: Sahir Ugur Eren, IKSV Media. Nearby the curator had installed a number of paintings by Indigenous artists including 16 Yirrkala Drawings (1947) by the Yolngu people and several bark paintings from the series Saltwater Paintings (1998). Paintings by Yolngu artists were used as evidence to prove their knowledge and rights over waters near their lands. Equally compelling was their Yirkala Bark Petition and Thumb-print Documents, 28 August 1963 which, as the title suggests was a petition to the Australian Parliament — typed, signed and surrounded by a painting on bark — claiming rights to ancestral lands which eventually effected changes in Australian law. Not far away from Istanbul Modern in Mimar Sinan Fine Arts University’s Tophane-i Amire Culture and Arts Center was the Australian touring exhibition ‘Concrete’. Curated around that theme by Geraldine Barlow — then Monash University Museum of Art (MUMA), now Queensland Art Gallery — it occupied an elegantly renovated eight-domed exhibition space originally built as an Ottoman canon foundry and armory. The show of 22 artists including Australian and those of Turkish and Armenian heritage was presented as part of the program ‘Australia in Turkey 2015’. Coming on the centenary of World War One, it considered ‘representations of loss, destruction and trauma in places around the globe . . .’ Barlow said. Curiously, this very fine exhibition (and venue) was unlisted as a linked event in the biennial guide though 38 others were. You might begin to see from these selected threads the kind of bold biennial ‘Saltwater’ was; it was bigger of course in concept, scale, geography and diversity of artists than these words suggest. In fact the end result of the biennial — its breadth, depth and capricious cross- and under-currents — may be even greater than the curator expected. 1. Carolyn Christov-Bakargiev comments and quote taken from ‘Istanbul Biennial commemorates Armenian genocide’, The Art Newspaper, 4 September 2015 (viewed online). The 14th Istanbul Biennial ran 3 September to 1 November 2015; except at Istanbul Modern where it continued until 26 November. See catalogue here: http://cdn.iksv.org/media/content/files/14B_Catalogue.pdf Australian representation at the 14th Istanbul Biennial was supported by the Australia Council for the Arts. Ian Were is an independent arts writer and editor based in Brisbane.